You came into my life with a bang. It was New Year’s Eve, just hours away from 2014. I was running late, on my way out, and the fireworks had already started. You ran into the driveway and hid under the car. You had a gash on your left flank. You were too scared to come out, so I took one of my carriers and left it out for you. I left a bowl of water and some kibble inside and left. The following morning you were still there. You let me tend to your wound. No coaxing, no questions asked. You acted as if we had known each other for a long time and it was normal for me to clean you. You knew that you had found your human, didn’t you? I already had 4 cats at that time. I had my two sets of tabbies and inky black fur kids: boy tabby, black girl, black boy, girl tabby. So even, symetrical, orderly. I didn’t want a fifth and a white one at that. You were so scrawny and generic looking; I called you gato—a cat in Spanish—because I wanted you to stay anonymous and separate from me and my clowder. But life never turns out exactly the way we plan it sometimes. You stayed, the neighbors started feeding you too, and they started to call you siopao (a pork bun) because you began to get, well, fluffy. I resisted and insisted that you remain just another gato. But you were hard to ignore. You would run and hop like a bunny every single time I would return home. It didn’t matter if it was at 1 in the afternoon or at 3AM. You were always there to meet me at the gate and walk me to my door. For a street cat you were well mannered and patient. You never had a hissy fit and you were incredibly light and full of joy. I would play with you in the afternoon and you would leave me “presents,” beautifully arranged remains of your prey, at night. It was funny that you would leave a bloody mess in the area in front of that cranky, old lady’s apartment and then offer spotlessly clean gifts on my doormat. The first time I had to take you into the house was during one of the biggest storms that hit the country, Yolanda. Again, you didn’t complain. I locked you in the downstairs bathroom with some food and water and a makeshift bed. The other cats were already familiar with your scent since you were always hanging out by the window. Slowly but surely you were becoming part of our family. You were now Gato. And then I decided to move. I was left with the dilemma of leaving you behind or to take you with us knowing that that I would be exposing you to 4 FeLV+ cats. But, it was an easy decision to make, actually. 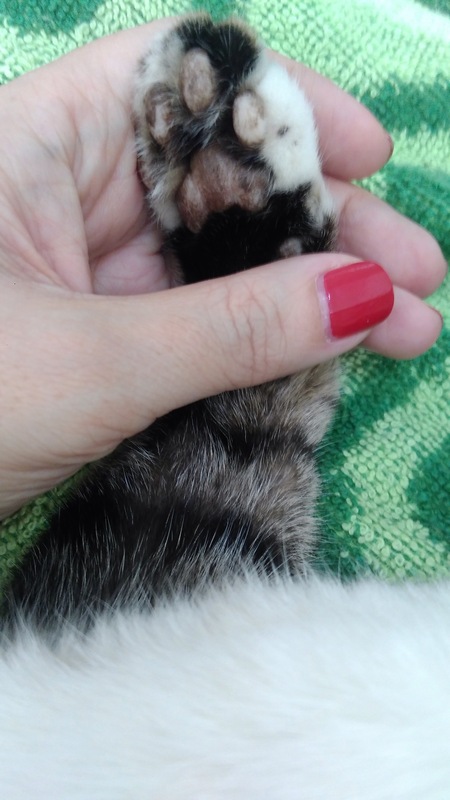 By then I could not bear to part with you, my Gatito. Maybe it was a selfish move on my part, but I could not abandon you. So the generic gato became El Señor Don Gato, the Condo Cat. There are so many pictures to share, so many stories to tell, but they will never be enough to describe how beautiful a soul you were. Muchísimas gracias for picking me to be your human. I must have done something good to deserve such a loving and giving fur child. You’ve sat with me through migraine and vertigo attacks, bouts of chronic fatigue, and dark days. I never knew that a tiny creature could do so much and leave such a huge void in my heart. Thank you for the endless purrs, Gato. I wish I could have given you more in return. Buenas noches, dulces sueños, mi alma. Tu viaje ha terminado. Cierra los ojos y descansa en paz, mi Gatito. Adiós por ahora, amor mío. Cuanto te quiero.